The only thing I could ever get my son to eat was pizza, rice, plain noodles and Nutella sandwiches. Then he turned 10 and apparently this particular birthday, he was granted culinary enlightenment. He started eating burgers and BBQ sauce and Sriracha! Chicken wings and ribs have become his favorite things to eat. I can actually put a serving of vegetables on his plate and he will eat them all! So when my son requests Chicken Parmesan for dinner, I am all over that! Of course, during dinner, he said he would have preferred the chicken Parmesan over noodles. Always a critique. 1-2 teaspoons of hot pepper flake, we like it spicy! *I am allergic to garlic. I know, tragic. You could add 2-3 more garlic cloves if you can handle it. In a sauce this big, 2 cloves of garlic don't affect me too terribly. In a large saucepan, melt the butter and olive oil over medium high heat. Toss in the onions/shallots and cook until soft. Add the garlic and the hot pepper flakes, cook just until fragrant. Pour in white wine and reduce the liquid, about 2 minutes. Pour in the pureed tomatoes, oregano and sugar. Bring to a boil and reduce the heat to a simmer. Continue to cook the sauce until it has thickened and reduced slightly. This should take about 45 minutes. Stir the sauce occasionally. Add the basil, salt and pepper. Continue to simmer for 5 more minutes. Turn the heat off the sauce and let it cool. PREPARATION TIP: I made 6 sandwiches with this sauce and had plenty left over for one or two spaghetti dinners. Pour the leftovers into a tightly sealed container and freeze for up to a month. The sauce will keep in the refrigerator for up to three days. 2 pounds of raw chicken, cut into strips. Preheat the oven to 350 degrees and line a baking sheet with parchment paper. I purchase my parchment paper from webstaurant.com. It's far cheaper than the roll at the grocery store and the paper is already cut to the size of the baking sheets. In a large bowl, whisk together all the dry ingredients. In a small bowl, whisk together the eggs and the hot sauce. Pour the buttermilk into the dry ingredients and use your hands to mush it around. The mixture will look clumpy. Put the chicken into the eggs, then into the flour. Press the flour into both sides of the chicken. Transfer the breaded chicken onto the parchment lined baking sheet. PREPARATION TIP: Raw chicken can be dangerous to your intestines. Once you have finished with all the dishes that have touched raw chicken, rinse with hot water, sanitize each dish and then wash with hot soapy water. Don't forget to sanitize your countertops! 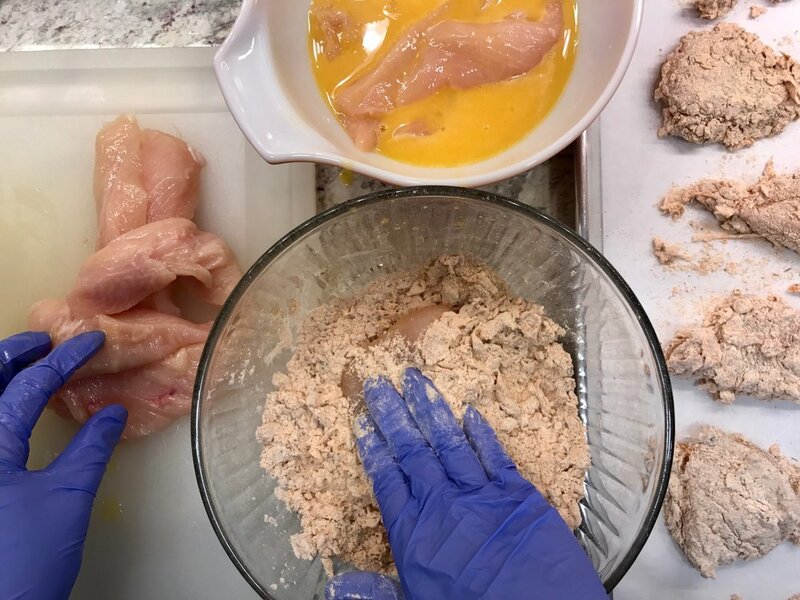 Drizzle olive oil over the top of the breaded chicken and then bake for about 15-20 minutes or until the chicken has reached 160 degrees. Split each roll almost in half, place two chicken strips inside the roll, top with sauce and provolone cheese. Notice the one sub without chicken, that's my daughter's "pizza sub." She hasn't had culinary enlightenment yet. Place the subs under the broiler for a few minutes or until the cheese is nice and bubbly. Dust each sub with Parmesan cheese. Subscribe to the blog and you won't miss the post for how to make amazing fresh baked rolls. As soon as the chicken is out of the oven and resting a moment, steam the haricot verts until desired tenderness. In a large bowl, whisk together the dressing and mustard. Once the greens are done, toss in the sauce and serve next to the subs. *My pantry is full of Penzey's Spices. One of those spices is a dry mix for Italian dressing. I like being able to make my dressing as needed and make as much dressing as I want. Saves lots of room in my refrigerator for the rest of my husband's condiment obsession.